The West Coast Ballet Theater's production of The Nutcracker promises to instill a love of the arts in young and old alike. The family-oriented performance, which features a cast of over 200 performers with internationally acclaimed guest artists, captures the magic, wonder and innocence of Tchaikovsky's beloved ballet as seen through a child's eyes. 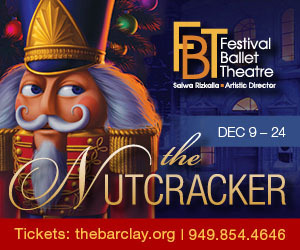 Spectacular sets, gorgeous costumes, special effects and live music by the San Diego Civic Youth Orchestra come together to create a stunning, grand-scale event that is sure to become a family tradition.